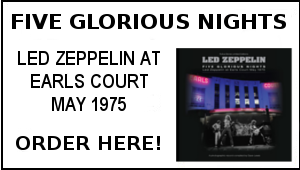 • Dave Lewis, Gary Foy and Cliff Hilliard were there on behalf of Tight But Loose displaying many rare photos and sharing decades of memories about all things Led Zep. Dave was also giving away samples of the superb Tight Boot Loose magazine he publishes four times a year (a must if you don’t already subscribe). 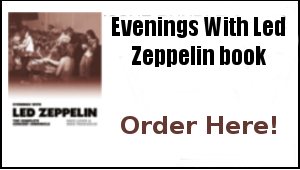 • John from North East Records had a superb offering of rare Zep and classic rock CDs and LPs – a very busy part of the event. • ABC Trust were in strong attendance with Andrew Webb, JR Warner, Pam Matthews and myself all helping to manage the raffle, donation table, auction and ABC information stand. 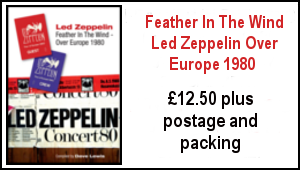 • A DVD presentation was played in the main concert hall in the build up to the Boot Led Zeppelin performance and was enjoyed by all. The screen was huge, with pristine picture quality and stunning sound being played back though the bands powerful PA system. • A guest speaker session with Dave Lewis was well received despite the fact that our planned speaker had to withdraw at the last minute due to illness. We wish legendary rock journalist Mick Wall a speedy recovery and hope that he can participate in a future event to support ABC Trust. • The charity auction took place in the main concert hall prior to the band’s performance. Whilst bids on the night were a bit disappointing I’d like to offer my sincere thanks to those that did bid and were successful in acquiring some highly collectable Zep memorabilia. Fortunately, we also promoted the auction online and received several bids through this route and so whilst some of the more valuable items did not sell on the night we did receive an acceptable offer for the rare prints and have therefore been able to raise a significant amount for ABC Trust. • In total, the raffle, donation table and auction raised £4,342 for ABC Trust which will go on to make a real difference for the children in desperate need in Brazil If you haven’t looked at what we do please, please visit www.abctrust.org.uk and become a supporter. Just £10 a month can help to make a meaningful difference where it is critically needed so please consider donating if you can. 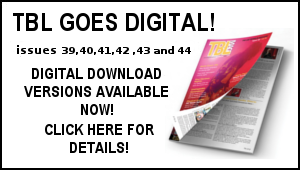 • Andrew Webb, Fatima Luna, Ali Monodee, Roberta Tasselli, Jimena Page and all at ABC Trust, Pam Matthews, JR Warner, Dave Lewis, Gary Foy, Cliff Hilliard, Raff Achour and all of Boot Led Zeppelin, Mark McFall, Ted Harvey, Max Ferguson, Frank Melfi, Lou Reddon, Frank Reddon, Marc, Frank the promoter, John from North East Records, Jimmy Page, Gary Davies, Phil Bushe. Thank you all for your efforts, donations and general support. It means a hell of a lot!